As a recruiter, the first place I look on your resume is the bullets under your recent work experience. Then if it looks like a good potential fit, I look back up to see your resume summary and other sections. Many other recruiters and hiring managers have told me the same thing too. So writing great bullet points on your resume is essential if you want to get callbacks for interviews. Fortunately, there’s a specific strategy you can follow to make your resume bullets stand out immediately. I’ll explain in the next section, and I also contacted a small group of top career coaches, resume writers and other career experts and asked them to share their best resume bullet point examples to highlight this strategy. So I’m going to share those with you too. The best way to make your resume bullet points stand out is to list specific accomplishments and results whenever possible. First, let’s look at what NOT to do (and what most job seekers do, unfortunately). And then we’ll look at some outstanding resume bullet point examples so you can see how other job seekers did this successfully. FYI, those points above are from an actual resume of mine when I was applying for jobs in a new city – from very early in my career before I became a recruiter. And that resume did NOT get interviews. It was a total failure. The big reason why: It’s not listing any accomplishments. It’s just stating what I was responsible for or what my boss assigned me to do. And that’s a sure-fire way to blend in, get your resume skipped over and NOT get the interview. Notice how those bullet point examples are very specific and use facts, data and real accomplishments. An added perk of doing this: numbers and symbols (like “$” and “%”) make your resume stand out visually before the recruiter or hiring manager has even read a word. This is very powerful for getting your resume read (rather than skimmed or thrown out). 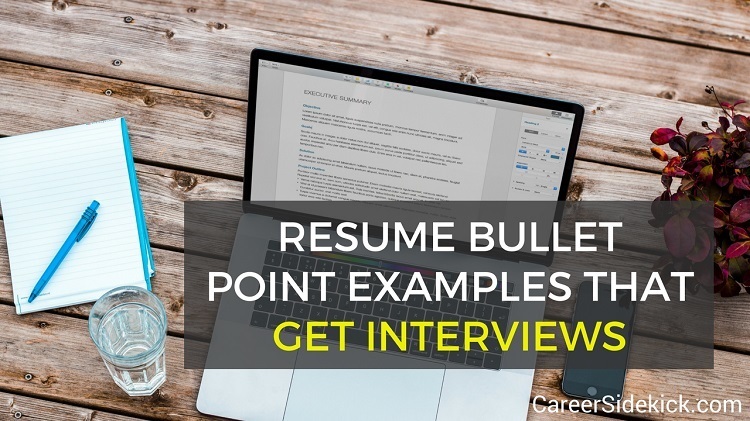 Now that you know the difference between listing responsibilities and listing accomplishments in your resume bullets, let’s look at examples of bullet points that have gotten job seekers interviews and job offers! Below you’ll find 19 bullet examples from 6 different resumes, contributed by different career experts. Some have more numbers and metrics than others, but they all focus on talking about what the person actually did and accomplished in their previous work. Successfully reduced worker’s compensation injuries from 20 to 2 in a one-year period through the introduction of a comprehensive employee incentive program. Brought organization back into federal compliance by establishing an organization-wide Leave of Absence process. Received corporate-wide Employee of the Year Award (pool of 1,250+ staff) and multiple Employee of the Month Awards (pool of 130 staff). This resume quickly earned the candidate an interview, followed by a job offer, as a result of effectively communicating both their responsibilities and associated accomplishments. Instead of focusing on what they do day-to-day (promote workplace safety and ensure organizational compliance), they highlight the end goal of their efforts (reducing worker’s compensation injuries and bringing the organization back into compliance). They then wrap it up with a final bullet that further backs up their accomplishments. Earned 2015 CIO of the Year Finalist accolades from the ___ Business Journal for directing a sustainable IT and global ERP strategy that supported 2.5X revenue growth to $3.5B through acquisition and regional expansion. Reduced annual expenses 15% by leading cost reduction, quality improvements, productivity initiatives and infrastructure enhancements supporting business systems, core network and security. Launched a 5-year, $32M strategy that integrated acquisitions to IT, corporate standards, core business platforms and governance for this company with 50+ global manufacturing + sales facilities. These resume bullets are proof you don’t need to be in sales to show quantifiable achievements. They are effective because they highlight skills key to CIO success…directing strategies that ensure IT supports executive vision for growth through expansion and acquisition, and by reducing bottom-line expenses. These achievement-driven bullet points taken from a mid-level office management professional’s CV are powerful for several reasons. The most important factor that all points share is that they demonstrate a clear positive impact that has been delivered to the business, solely by the candidate in question – this shows potential employers the benefits they can expect from hiring this person. These achievements are also quantified which gives readers no doubt as to what level of impact this candidate delivers, and also allows them to benchmark them against competitors. Overall these points really demonstrate the ROI they will get if they invest in this individual. You might not know it from reading these bullets, but this resume was for someone relatively new in their career as a management consultant. But by showing the size of projects you’ve worked on, or the size of companies/clients you’ve worked with, you can immediately sound more experienced and more impressive. So when you add metrics/data to your resume, think about your own accomplishments, but also lean on the impressive figures related to companies you’ve worked with and projects you’ve worked on. Use those to make yourself sound better! It’s crucial that your resume shows off all you’ve accomplished, which goes a step beyond simply listing your responsibilities. This resume does a great job of doing both simultaneously, slipping impressive achievements in along with day-to-day duties. This professional shows they’re able to collaborate with both teammates and clients to improve the forecasting process and its effectiveness. This wasn’t done with an empty plate, either — this person was simultaneously responsible for forecasting nine other accounts while improving the overall process. That type of multi-tasking ability won’t be ignored. This is a software sales executive with a lengthy career for top software firms, including Fortune 500 companies. If you work in sales, you’re going to have an easier time finding accomplishments, data and results to put on your resume. But in any profession, you should try to have at least some of your resume bullet points looking like this! You’ll notice that these bullets stand out visually because of the numbers, which boosts the chance they’ll get read. If you read this article, you now know the difference between listing responsibilities and accomplishments on your resume, and how to use those accomplishments to write great bullets that will get you a call with a recruiter, or an invitation to interview. Now it’s time to start digging up data and updating your own resume in the same style as the bullet point examples above. If you’re unsure about your own past accomplishments and results, talk to your former boss or coworkers and try to gather data. It’s absolutely worth it. You’ll have those facts on your resume for your entire career now, and you can talk about it in your interview answers too. If you follow these steps, you’ll get more interviews and will likely get hired for a better job.